Reading reviews of theatre shows can be dispiriting as a costume professional because your work is seldom commented on or judged. At the risk of causing costume designers to panic by calling for a great new age of costume criticism, I want to send a plea to reviewers to consider devoting attention to costume in their reviews. I understand the constraints of word count: I draft many versions of this column before I hand it in, but there must be more to it when practically every review I read manages to omit the work of the costume designer when namechecking the creative team. There seems to be a hierarchy in reviews about what bears referencing and what can be left to the imagination. All reviews give space to the set: either a detailed description, or something about the mood it creates, the place it takes you to or the function it provides. Some more adventurous souls will describe the lighting, how it evokes mood and shapes the story. If you are very fortunate, the sound will get a mention too: previously that was the poor relation sitting with costume on the buddy bench, but reviewers have recently become emboldened to comment on it. Finally, if the play is historical or fantasy, the costumes get a mention. If the costumes are contemporary, we are to assume that the actors brought them from home. I see so many shows in which the costumes add immeasurably to the play – where they show time and place, help define the character arcs, anchor the characters in reality against the deliberately artificial nature of the set or work in harmony with the set, light and props to create a hyperreal otherworld. Costumes can bring richness or pare back to simplicity, costumes can make you laugh in recognition, make you empathise, cover a quick change or trickery, transport you to another place. And yet so often the costume designer has not been credited, nor mentioned in any way. And alongside reviews are photos, usually of the actors wearing these impossibly invisible costumes. If you think I am overstating the issue, I could point to any number of reviews, but will settle for a recent one that leapt out at me, about the West End transfer of The Twilight Zone. 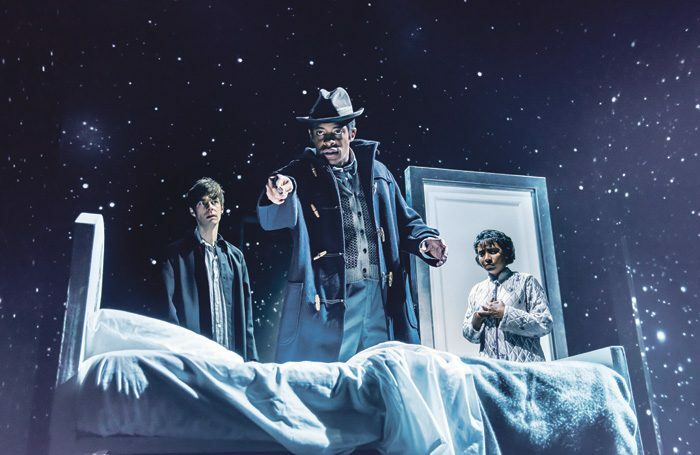 The piece told us about director Richard Jones’ monochromatic production brilliantly capturing the things that made the original TV show so compelling. It hailed choreographer Aletta Collins’ work perfomed by “boiler-suited” stagehands on designer Paul Steinberg’s set. How is it that costume designer Nicky Gillibrand’s work in achieving these monochromatic costumes, or these camouflaged boiler suits, doesn’t merit her name being mentioned alongside the rest of that exceptional creative team? Did the reviewer simply not know that there was a costume designer? Or is it that the amazing set, light, sound, movement, direction, are all noteworthy but the costumes are not?